With the crucial assembly elections in Bihar scheduled to take place in October-November, a large section of people are looking forward to a change of guard and hoping for a positive and refreshing change to sweep across the state in the coming years. Meanwhile, Prime Minister Narendra Modi in his speech at the first Parivartan rally in Muzaffarpur on July 25 sounded BJP’s bugle call for the transformation of Bihar from an under-rated actor, waiting in the wings, into a lead character on the centre-stage in the dramatic political events about to pan out shortly. After that, he addressed three more Parivartan Rallies—in Gaya on August 9, in Arrah and Saharasa on August 18 and in Bhagalpur on September 1. Meanwhile, the voters of Bihar are currently on a roll, taking pride in being accorded by the nationalist forces a break to emerge at last from the shadows and constricted contours of regional politics to take their rightful place in the national politics. They are also enthralled at the prospects of aligning the State’s political destiny with the engine of development that appeared on the national scene last year and has since been chugging on in its inexorable march to the country’s ultimate goal of emerging as the ‘Vishwa Guru’. Bihar has never lagged behind in playing its part in the process of shaping or moulding of the country’s destiny right from the pre-independence days. Nor is it likely to do so this time around either. For the State and the people of Bihar, the elections due later this year provide a windfall opportunity to sever their connection with the State’s dubious past of caste and communal politics and usher in a brave new world of mainstream politics and pan-Indian model. Of particular importance in the course of the developments leading to the present stage was Prime Minister Modi’s landmark announcement of a stupendous special package of Rs.1.25 lakh crore for the State, which he said had been “yearning for development and progress”. The package, which covers a wide range of development sectors such as roads, highways, petroleum refineries, gas, airports, rural electrification, education, health, farmers’ welfare, digitalisation of Bihar, etc, is expected to change the economic landscape of the State tremendously. One would, therefore, have thought that the package would be whole-heartedly welcomed by the entire spectrum of political parties and stakeholders in the State’s development and progress. But that is not what transpired! While the Centre’s special package is bound to act as a catalyst for the accelerated growth of the State’s economy and the people of Bihar would undoubtedly be the beneficiaries, Modi’s political rivals feel outwitted and threatened and are bitter over the introduction of a “game changer” by the Prime Minister. Not surprisingly, Chief Minister Nitish Kumar gave vent to his disappointment and sense of helplessness when he reacted by lashing out at Narendra Modi for “bidding” for Bihar. He exhibited his characteristic braggadocio when he called the special package a trumped-up one and threatened to expose the “real truth” behind the package soon. It was indeed a splendid display of a remarkably narrow mindset that would not allow the regional politician to rise above the usual antics of a mere powerbroker! Being neither a sop nor a mere promise, the package was a windfall offer of a badly needed economic assistance by the Centre on an unprecedented scale. It was a wonderful opportunity for the State to shore a much-needed breakthrough up the alley of its beleaguered economy. However, the occasion turned out to be yet another case in point, which proves that it takes as large a heart to appreciate a real crackerjack of an act of goodwill as the one that conceives and delivers it. And again, notwithstanding how the people of the State feel about the economic benefits expected to accrue, thanks to the special package, the politicians of the back alleys of Bihar are hardly likely to grow out of the caste and communal mould that has kept the State tied to the shackles of laggardness in the first place. And yet, Nitish Kumar has been demanding special category status for the State to place its economy, which is in tatters, on an even keel. It is a matter of abiding shame and embarrassment that political battles have traditionally been fought in Bihar, as in several other Indian States, on the lines of casteist or communal politics. It would appear by implication that those politicians who had vote bank politics for strategy had the only aim of winning polls on the unquestioning support of an entire community or caste whose narrow interests they were espousing on the basis of sops, freebies and populist schemes, with absolutely no concern about the development and progress of the State as a whole. For the self-serving practitioners of the fine art of vote bank politics in Bihar, the forthcoming elections present yet another opportunity to hone their skills and put them to good use for the purpose of perpetuating their hold on the levers of power in the State. On the one hand, the RJD-JD (U)-Congress coalition has been bitterly complaining against the special package that helps bolster the development plank of NDA’s poll strategy. On the other hand, RJD Chief Lalu Yadav has accused the NDA of trying to split the Yadav-Muslim vote bank by helping Asaduddin Owaisi’s All India Majlis-e-Ittehadul Muslimeen (AIMIM) contest the elections and garner Muslim votes to the detriment of the RJD-JD(U)-Congress coalition. Fear of a split in the Muslim vote bank owing to the Owaisi factor, and the apprehension that the Yadav segment of the electorate may also not vote for them en masse this time around owing to the presence of Yadav leaders in NDA, have sent tremors down the ranks of the RJD-JD(U)-Congress grand alliance. The camp opposing NDA would much rather have the Muslim segment of the electorate believe that BJP is and has always been a party of Muslim-baiters and is, therefore, against Secularism. Likewise, they do not favour the idea of the splitting of the Yadav votes. They are keen on keeping the flock of the Muslim-Yadav vote bank in their stranglehold by operationalising their tried-and-tested strategy of playing the Communalism card against NDA and offering the vote bank constituents sops and populist schemes. The hypocrisy of extending unabashed support to a particular religion or a community in the name of promoting Secularism or warding off casteism does not in the least make them feel queasy. Such is the audacity of political rivals of the NDA of arrogating to themselves the mantle of champions and protectors of the interests of these groups. It shows the ugly underbelly of vote-bank politics practised with such ease and aplomb against the development agenda of NDA. It is time for Bihar to choose between the progressive and development agenda of the NDA and the regressive vote bank politics of the RJD-JD (U)-Congress combine. The RJD-JD (U) coalition has no economic agenda whatsoever. Lalu has made it clear that his coalition is fighting against “fascist and communal forces”. There is nothing more to his agenda. The champions of pseudo-Secularism have no intention of being ever concerned about the State’s economy and have apparently been “dedicating” and periodically “re-dedicating” their lives every time there is an election, to fighting “fascist and communal forces”. How they propose to do the fighting is by identifying the BJP with Communalism and entering into a grand coalition against that party with whosoever is ready for such collaboration. When the BJP or the NDA, of which it is a partner, talks of development politics, the RJD-JD(U)-Congress clique counters it with the talk of communalism and secularism. As Lalu once famously said, development projects do not fetch votes, but talking of the bugbear of communalism and secularism does! Lalu has further dared the Prime Minister to bring back black money stashed away at overseas tax havens in keeping with BJP’S poll promise of 2014. Conveniently overlooking all the good work already initiated by the NDA government in this regard, he went ahead and taunted Modi by stating that the latter was incapable of vindicating his promise of unearthing black money. Referring to onion prices shooting up across the country, albeit due to shortage of production, he made a jibe at Modi about the latter’s “inability” to unearth stocks of onion hoarded by black marketers, let alone unearth black money, thereby making a facetious charge over a matter of great national importance. Such flippant quips and facetious comments made in casual reference to matters of national importance do get a moronic claps and guffaws from his roadside audience who are out for a good time and even endear this clown to the mainstream media, which is all the time on the lookout for sound bites (the nastier the better). Whether his antics and buffoonery are capable of translating the amusement and titillation of the audience into votes in this age of right to information and vibrant social media, which have transformed the common man into less gullible and more knowledgeable and discerning a voter, is a foregone conclusion. Never the one to shy away from fishing in troubled political waters, Delhi Chief Minister Arvind Kejriwal has thrown his hat in the ring by agreeing to campaign for the RJD-JD(U)-Congress coalition. The plank of his campaign? Why, corruption, of course! There was a time when he called every political party in the country corrupt and declared that all politicians were crooks and guilty of complicity. Today, his ire is exclusively targeted at Prime Minister Narendra Modi and the BJP. In the name of fighting corruption, he is campaigning for the defeat of the BJP and its NDA allies in Bihar. What is more, he is working hard for the success of some of the most discredited and corrupt political leaders and ideologically bankrupt and irrelevant political parties in the country. As recently as a few days ago, the Supreme Court had issued a notice to Lalu Yadav on a plea by the CBI against the dropping of certain charges in one of the FIRs by Jharkhand High Court in the multi-crore fodder scam in which Lalu had been convicted and is currently out on bail. As regards Nitish Kumar, he has no reservation or compunction about working with a fellow politician of Bihar with whom he has a love-hate relationship and who is convicted on multi-crore corruption charges. Besides, he had no qualms either about being egoistic while turning down point blank an aid of Rs 5 crore from the Government of Gujarat for the people of Bihar who had been affected by floods in Kosi river in 2008. This he did without caring a whit about the distress of the people of his own State and their need for relief or the sentiments of the people of Gujarat who had contributed the amount, making a prestige issue of accepting the aid from his political rival. Why accept the aid and let Modi, the then Chief Minister of Gujarat, hog the credit for coming to the rescue of the people of Bihar, earn their goodwill and make political mileage out of it, was his line of reasoning. He had no conflict with his conscience about placing a false pride and prestige before the distress and sentiments of people. In short, politics before people. Furthermore, now Arvind Kejriwal is all set to wage a war against corruption by joining hands with Lalu Yadav, who is convicted on multi-crore corruption charges, Nitish Kumar who puts politics before people in distress and in need of assistance, and the Congress which is neck deep in numerous cases of scams and corruption charges and is under investigation and litigation. A unique way indeed of fighting corruption! Having fought and won elections for the Delhi Assembly twice, both the times on the plank of fight against corruption, and formed the government both the times, he has so far failed to introduce his much promised Jan Lokpal Bill and Swaraj Bill in the assembly. 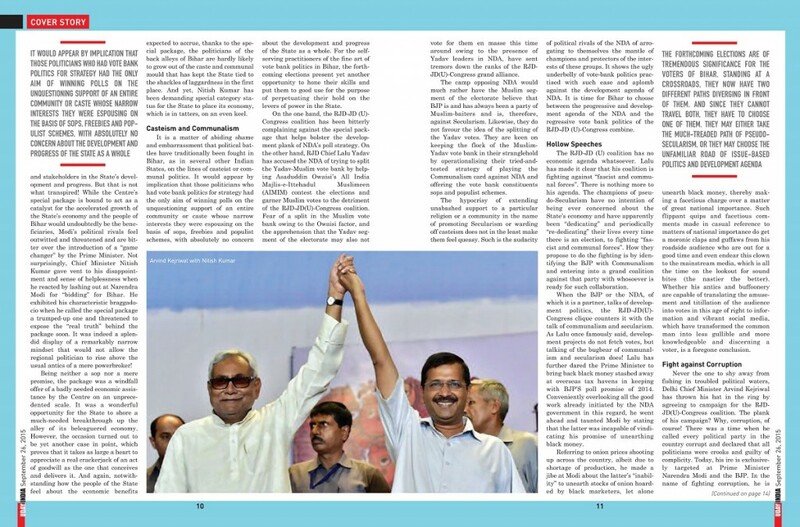 If he could not accomplish the task of passing the two anti-corruption Bills to which his Aam Aadmi Party owes its existence, despite having a steamroller majority in the assembly, how does he hope to win over corruption in Bihar by campaigning for tainted and convicted parochial politicians who lack an economic agenda and a pan-Indian vision and are preoccupied with perpetuating family rule? Bihar, one of the poorest States in India, is about to go to polls that are, according to media reports, expected to be the costliest ever. The exact dates of the election have been announced, and the campaigning already commenced. Having to stagger the publicity and campaigning over a period of more than two months, the candidates are already bewildered by the huge cost of electioneering. The estimated expenditure of each candidate on campaigning is expected to cross the Rs 1-crore mark. However, the expenditures admissible in terms of the ceiling fixed by the Election Commission (EC) are in the range of Rs 20-28 lakh. In this context, would it sound too cynical an observation if one called India’s elections the cradle of political corruption and fountainhead of black money? Given the candidates and their parties have to resort to plying enormous amounts of unaccounted money into their campaigns, these undoubtedly seem to be very apt observations. The forthcoming elections are of tremendous significance for the voters of Bihar. Standing at a crossroads, they now have two different paths diverging in front of them. And since they cannot travel both, they have to choose one of them. They may either take the much-treaded path of pseudo-secularism, or they may choose the unfamiliar road of issue-based politics and development agenda. Here they just need to remember that if they go for the first option, it will lead their beloved state to the murky world of regional politics—a veritable ‘jungle raj,’ stalked by ideological dwarfs and political pygmies with arrows tipped with the poison of casteism and communalism. On the other hand, if they opt for the second alternative it will open up for them a brave new world of social development and economic progress like never before. It will also enable them to finish an important task of seeking out and identifying the politicos who are out to fish in the troubled waters of Bihar and eliminate this scourge from their State forever. But BJP’s allies, Ram Vilas Paswan and Manjhi cannot be trusted. They will try to fish in troubled waters, namely casteism. Moreover, Paswan is a known turn coat. This is right. 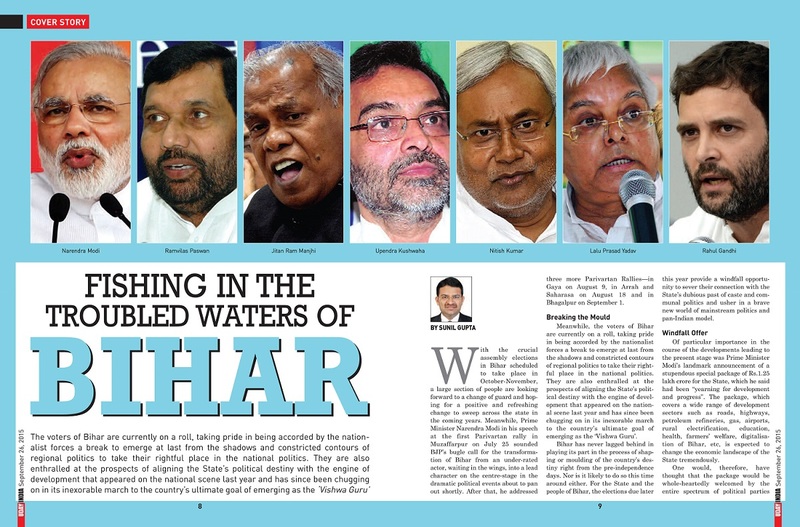 For people of Bihar its time to move above regional politics and align with the national politics. If people will again choose those regional leaders only thing that can happen to Bihar is loot, poverty and mismanagement. See our country can become vishva guru only on one condition, that is all states and central government come under one party so that decision making becomes quick and for this BJP is the most capable party in present circumstances. Is BJP not playing communal politics? Why have they collaborated with Manjhi? Why they joined hands with Paswan? These questions should be answered first by pro-BJP people like you. Can I just say what a relief to discover someone that actually understands what they are talking about over the internet. You definitely understand how to bring a problem to light and make it important. More and more people really need to read this and understand it. This is really interesting, You are a very skilled blogger. I look forward to seeking more of your great post. Also, I have shared your web site in my social networks. I want to to thank you for this fantastic read.. I absolutely enjoyed every bit of it. Most of what you articulate is supprisingly legitimate and that makes me ponder why I had not looked at this with this light previously. Your article truly did switch the light on for me personally as far as this particular subject matter goes. Nonetheless at this time there is just one point I am not too cozy with and while I try to reconcile that with the actual core theme of your issue, allow me observe what all the rest of your readers have to say.Very well done. kejriwal in support of Nitish Kumar. Now with this one thing is sure that because voters have seen the downall of Delhi they will not vote for anyone for whom Kejriwal stands for. AAP is on a losing stance and so will be Nitish and his supporters. Lalu Ji with Sonia Ji. Sonia Ji with Nitish Ji and Mulayam ji in favour of coalition politics. Then where is regionalism in this? You say regional because BJP is a national party and you support them. Corrution is the biggest issue in all non-BJP states. Under no conditions can a coalition with Lalu Prasad Yadav be backed because he is himself convicted for corruption. I am sure that as you say, people will choose BJP this time. When regional parties come together chaos and illogical demands are seen. In case they win they will fight over CM post then for ministries then for packages for their constituencies. Narendra Modi himself is involved in Hindutva politics and you say that he will bring development. Nitish ji is the favourite chief minister of Bihar and once again he will form the government. We are all with him. Bihar is poor because politicians have eaten up all the resoures of the state. Once we get an honest CM Bihar will be number one bacause we are the most intelligent people. See IITs IIMs and UPSC results to know more. Can you also write on what secularism and communalism actually mean. Today people have taken those who stand for Hindus as non-secular and those who stand for Muslims as secular. So wrong this is. First we have to understand the meaning of both terms. The site looks absolutely fantastic. Well done to all involved. Very professional. the navigation is great too. Cheers.